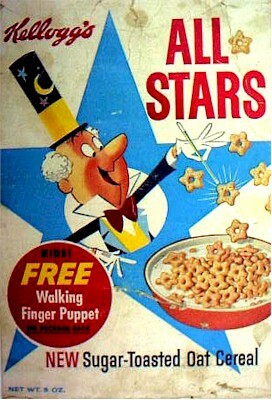 Sugar Stars were reformulated from a basic oat based cereal similar to Frosty-Os (but identical to Kellogg's OKs with a sugar coating in the shape of stars) to a sticky caramel cereal that was hard as a rock and never got soggy in 1964. The new version was simply called Stars. I loved the old version but hated the new one. So, when I thought no one was looking I took one of the older boxes and put it all the way to the back of the shelf every time I went to the store. I was able to eat the older version for six months after the new version came out. I wasn't the only one who didn't like the new version. Kellogg stopped making it about a year later. I was only six when I "rotated" those boxes. The original name was All-Stars. It was renamed Sugar Stars about 1961.